I have been a Pampers fan from the beginning ever since the hospital provided us with Swaddlers during our stay. Now that my son is about to size out of Swaddlers, I was excited to have the chance to try another style since we will need to make a switch soon. 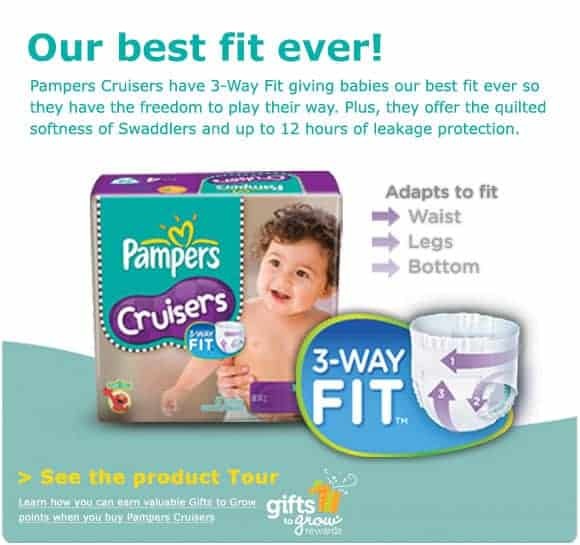 I was fortunate to be asked to review Pampers Cruisers with 3-way fit in honor of the launch of the Canadian Pampers Facebook page. Pampers Cruisers are designed to adapt to your baby’s waist, legs and bottom. They are as soft as Swaddlers, but provide the flexibility that a baby on the move needs. I absolutely love the way these fit my son. I feel like they adjust to his shape perfectly, providing a comfortable fit that keeps everything in. In the time I was using them, we experienced zero leaks of any kind. I love the adorable Sesame Street designs. Each diaper features a character peeping out on the front and several characters on the back. They are very easy to adjust and the tabs stay firmly in place. I found them to be extremely absorbent and they lasted throughout the night. I am definitely going to be purchasing these from now on! I love them even more than Swaddlers. Cruisers are available in sizes 3-7. In honor of the launch of the Canadian Facebook Page for Pampers, one lucky reader will win two packages of Pampers Cruisers with 3-way fit diapers, Pampers wipes and two Facebook sweatshirts.